Still in command: Arnie is back! Arnie always promised he’d be back, and we always believed in him. But then he went into politics, passed the gauntlet on to the likes of Jason Statham and The Rock and vanished, only to reappear in snippets of Sly Stallone’s Expendables films. 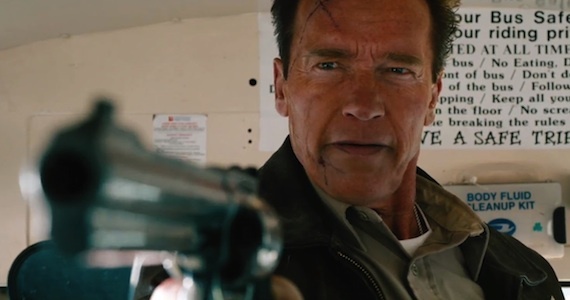 Now, aged 65, Arnold Schwarzenegger is back once more, the lead in a boisterous action movie with a threadbare plot. The more things change… eh? The Last Stand sees Arnie play Ray Owens, the inexplicably Austrian sheriff of the US/Mexico border town Sommerton. Ray is, of course, a former top narcotics agent who saw too much bloodshed in LA, and has opted for peaceful retirement. No such luck. After a daring escape, cartel godfather Gabriel Cortez (Eduardo Noriega) flees the FBI in Las Vegas, headed for the border in the world’s fastest car. His goons have already set up a temporary bridge across the gorge that separates Sommerton from Mexico, but the Feds aren’t expecting him to make the crossing there. So it’s up to the aging sheriff and his motley crew of hick cops and volunteers to protect the desert town from the mercenaries and impede Cortez’s getaway. With a plot that simple, you’d hope The Last Stand could spice things up with plenty of action and comedy, but chances are you’ll be disappointed. The action comes in weak jolts until the eponymous last stand (more on that shortly), and almost all of the one-liners fall flat, revealing the half-heartedness of Andrew Knauer’s script. But if you can stick with it to the final act, action fans will be rewarded. The English language debut of Kim Ji-woon, the Korean director of the demented comedy Western The Good, the Bad, the Weird and the excellent thriller I Saw the Devil, The Last Stand’s finale is a fine shoot ’em up setpiece. There are some excellent kills in the vein of Good, Bad, Weird, including the most gloriously brutal use of a flare gun since Dead Calm, and there’s enough humour playing on Arnie’s age to earn a few good giggles. The final showdown between Ray and Cortez is thrilling, as the two play a game of cat and mouse in a cornfield, before a punch-up that sees Arnie’s sluggish strength match the villain’s weaker but more sprightly frame. Arnie, looking a little too much like a wax model of himself with terrible hair plugs, has command of the unchallenging role, although the dreadful one-liners give him no chance to use the comedic muscles he used to flex so well. Noriega is your bog-standard ethnic villain, but Peter Stormare really cranks it up a notch as his malicious number 2. Forest Whitaker slums it shamelessly as the FBI chief on Cortez’s trail, while Luis Guzmán gives it just the right amount of silly as Ray’s deputy. Harry Dean Stanton appears all too briefly in a typically fine cameo, while Génesis Rodríguez is in there, somewhere, you probably won’t notice. She’s awful. In the film’s biggest surprise, Johnny Knoxville is actually quite entertaining (or at least not annoying) as local gun-nut Lewis, who supplies the heroes with their heavy firepower in the tradition of the greatest of all desert town defence movies – and no, I don’t mean Rio Bravo, I mean Tremors! Formulaic to the last, The Last Stand is passable action fluff, but certainly a disappointment when Ji-woon’s past career is taken into account. At the very least, it’s proof that Arnie’s still got it. Of course, at no point in The Last Stand does he utter the immortal line “I’ll be back”, so this time we can’t be sure he will be. With disappointing box office turnout around the world, hopefully this won’t come to be Arnie’s actual last stand. That would be the biggest disappointment of all.